"BeachComberBum" Does the Beach Combing for YOU ! BeachComberBum, Paul Umlauf, has lived in Alaska for over 50 years. He is a retired commercial fisherman and a long time Super Cub pilot. Spring, Summer and Fall bring both beachcomberbum and Ms. Gertie searching the far Alaskan beaches to find all the glass floats they can. ​We sell authentic antique Oriental glass fishing floats. These gems of the sea are becoming more and more rare, so take advantage of the chance to purchase a few at great prices! "Beach Combing" searches of distant Alaskan beaches produce the authentic, aged and unique glass floats we sell. 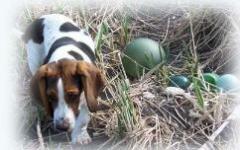 Basset hound, Ms.Gertie is a wonderful beachcoming companion.